I will be happy to suggest suitable ideas and costs." Usually a site meeting is beneficial and a potential client is expected to cover any travel involved. At this meeting I would talk through any ideas of your own, offer my own suggestions and make you aware of the practical issues involved in the mural project. 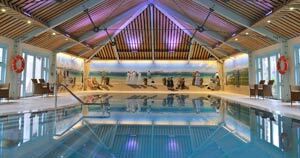 Often it is a good idea to request the site meeting during the early stages of a new build or refurbishment (for example if you are building a swimming pool) as there are some lighting issues to discuss before wiring is installed. 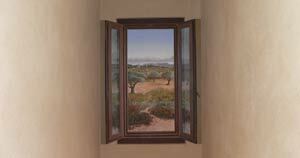 Careful lighting is critical for the success of a truly stunning trompe l’oeil illusion! I am happy to offer up a brief sketch showing my ideas but a full scale drawn design for the wall painting will only be done when I have been commissioned to paint a mural and is included in the first payment instalment for the project which would normally be 50% of the total fee quoted. The final wall painting will be exactly as shown in my design but obviously changes can be made at the drawing stage rather than later, which would incur extra costs. I will assess whether the painting can be produced more economically off-site in my studio to be later fixed to the wall in situ by an expert team of colleagues. I will give a quote for the work involved, which is based on a fee for my time spent painting plus materials, studio costs, travel expenses, insurance and delivery costs. Working off-site has many advantages, both financially and practically. My studio is very well equipped and has plenty of room for large canvasses. Although there are extra costs involved in making up stretchers for large canvasses, these are minimal compared with accommodation costs and scaffold hire on site etc, not to mention the inconvenient presence of an artist and all her attendant clutter working on the site for a period of weeks or even months! 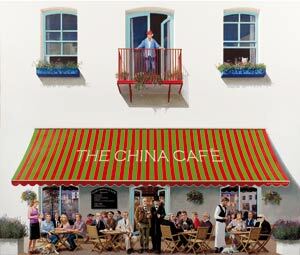 Truly amazing trompe l’oeil painting takes hundreds of hours of laborious work to produce. My own experience leads me to suggest that wherever possible paintings are best done off-site! 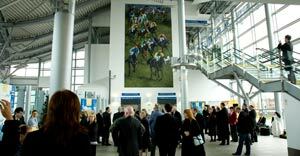 The prints are often done on 0.5mm self adhesive vinyl which can be either stuck straight on to wall surfaces or, in some cases, stuck to aluminium panels which can be fixed to the wall on rails. I expect 50% of the fee to be paid in advance and the balance to be paid immediately upon completion. Materials/insurance/travel/delivery and other expenses are always additional to my painting fee which is charged on the basis of time spent on the painting and not on the area covered! If you are interested in commissioning a portrait or other painting, it is a good idea to telephone or email me to discuss the work. 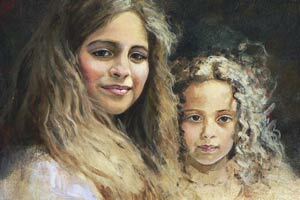 Portraits are always done in oil and I need about six three hour sittings to complete the work. I prefer to work in my studio, even if the portrait appears to have been done somewhere else. I can easily marry a background to link my subject to their own personal surroundings, but still prefer to have the subject in person in my studio! Local accommodation for subjects can easily be arranged! For horse portraits, I need to visit the animal for a photography session and the client would be expected to pay travel and accommodation costs.